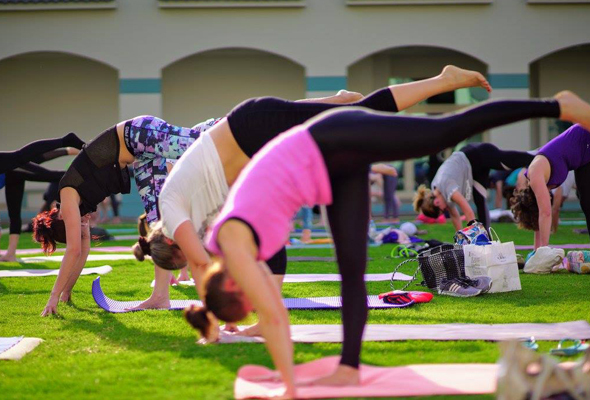 Make sure you’re free on the weekend of November 15 to 17, when Yogafest Dubai is set to make its return. The festival will take place at the Dubai Internet City Amphitheatre, and will see more than 5000 enthusiasts coming together to enjoy free sessions centred around yoga, wellness and sustainability. This year, there will be more than 150 classes and workshops by local and international teachers, including yoga, pilates, dance, qi gong and meditation. You’ll also be able to attend talks on healthy living, family nutrition and yoga philosophy. New for 2018 is the Shakti Tent, which will be for women only, and the Al Jalila Foundation Tent, for people of determination. All donations from this year’s festival will go towards the foundation’s Ta’alouf programme, which supports carers of children with special needs. There will also be a family tent, offering kids’ yoga classes, prenatal yoga, mother and daughter yoga, family yoga and partner yoga. The festival is dog-friendly, so your four-legged friends can join in on the fun, too. Yoga fans can also shop for unique products from a range of eco-friendly vendors – you’ll find everything from homemade aromatherapy sprays to yoga leggings made from recycled plastic. How can you get involved? Yogafest is donation based, and you need to register online here to confirm your attendance. The two-day ticket allows you to access any class across the eight tents (spaces are on a first come, first seated basis).